In a large bowl, mix all Cake Ingredients with an electric mixer. You're going to want to do this for about 5 minutes. Make sure you get all the ingredients off the side of the bowl and that is it thoroughly mixed. Spray 9-inch round cake pan with Baking Spray. Pour half of the Cake Mix into the pan and bake for about 15-20 minutes. Check to see if it is done by poking the center with a bamboo skewer and seeing if it comes out clean. Once it is evenly baked. Gently place the Cake on a cooling rack. Wipe down the cake pan with a paper towel and respray with Baking Spray. Pour the other half of the Cake Mix into the cake pan and bake for about 15-20 minutes. Remove form the oven when you can insert a bamboo skewer into the center of the cake and remove it cleanly. Gently place on the cooling rack. Let the Cakes cool about 10 minutes. In another bowl make the Frosting. Beat Powdered Sugar and Margarine with an electric mixer until blended. Stir in Vanilla and Chocolate. Gradually beat in Almond Milk. If the Frosting is too runny add more Powdered Sugar - if it is too dry add a tiny bit more Almond Milk. Add the Almond Milk like a drop at a time. Place the largest of the Cakes on the cake stand. Spread the Frosting on the cake evenly. Once you have a nice even layer of no more than 1/2 a cup of Frosting - Gently place the other cake on top. Then coat the sides of the Cake with a layer of frosting to seal in crumbs. Then you can take what frosting you have left and frost the remainder of the cake with little swirls. We decorated with these vegan Pralines and Chocolate Sprinkles. Nom. *Since I'm being obnoxiously emotional - I'll share with you this video filmed the year I was born and set to music they played at my prom. Every time I see the spot with just the black cons - I admit I get a little choked up. It's like some one recorded one of my memories. Great blog. i'm 44 so don't feel TOO old! Cake looks amazing. Can't wait to try it and the frosting out! YAY!! People hear "vegan" and immediately think "bland". I think this cake would effectively put an end to that! So simple to make and to replace! 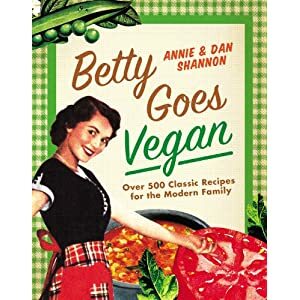 my life plan was going to write "betty crocker goes vegan"
in such a way that makes me salivate in rem state murmuring about cake. This looks yummy! But why did you bake the halves separately? Do you only have one cake pan? what is the measurement of cups in to some form of english measure? I just made this today and these english conversion worked great!